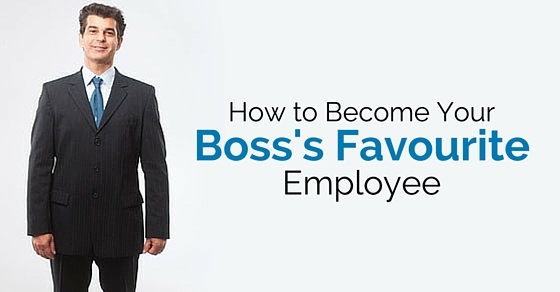 How to Become your Boss’s Favorite Employee? There are ample reasons in order to become the star of your team. You may have an idea to gain a promotion or a raise. You may want to change your bad looks which boss has on you and many more reasons urge you to become your boss’s favourite employee. Your boss is the only individual who can help you grow in your career. They are ones who work in a number of ways to reach success. Making your superiors happy is also a part of the job. Hence let’s glimpse through how to become your boss’s favourite employee. The very basic aspect to start off with is the usual stuff where you need to turn up on time every day. Instead of providing lame reasons for all sick aspects it is good to turn up to office and reserve days for sickness for worse cases. The main intention is to avoid an unnecessary absence. Being reliable can also mean that the boss should count on you for various aspects. An example can be that he must point you at times work is not done by others. You can be an employee working in a very big organization and one recruited by your boss. Though you are recruited one among a hundred, in order to get noticed by your boss, you need to stand out of the rest which can be achieved by working to the maximum and smashing the targets. Yet another way to get noticed by your boss is by participating in company’s culture. You could make suggestions and smoothen certain operations that happen. Becoming the representative and also participating in charity events is one more way to get noticed. Also by participating in the various social events mentioned, represents your boss that you participating in lot more activities than everyday work. Many may think that this is really obvious but it is really important to work hard in order to become your boss’s favourite employee. As an employee, you need to do better than a mediocre job to grasp your boss’s attention. You can also opt for overtime which opens up your willingness to work. You are prone to miss your favourite match or cocktails but remember that you can become the best employee in town. Arriving tired and exhausted to the office and complaining about all the issues that whirled last week can be a demotivating factor. Your boss does not want to see all that, you should be fresh, energetic and enthusiastic every morning which can bring a smile to your bosses face. Discuss about the best things that happened around and always remember to wear a smile on your face and enjoy everything you do in office. This is also a smart way to become your boss favourite employee. When there needs to be a restructuring aspect in the team or few experiments that need to be accomplished in the procedure you work for, permit and do not be resistant. Try to assist and follow a flexible approach and help your boss in such aspects. When you’re able to foresee any issues in the organization make sure to discuss them with your boss. At times when you’re in job, your boss would have taught you things that are mandatory for your job, but remember that there are many other aspects that are outside the job scope which should be educated and familiarized. Unofficial or unwritten shortcuts should be learned which are mandatory to handle certain people or things. Your boss would be impressed about the usage of these shortcuts at work and conclude that you have an intention to learn and hence this asset will help you propel in your career. You can become your boss favourite employee by learning more aspects within your organization. It is important to give feedback when requested for. It is also equally important to remember that, feedbacks should be put to use and only then it is beneficial. When you’re providing feedback regarding certain problem area, make sure to provide appropriate solutions too. Also, bear in mind to suggest solutions rather than forcing them. Every employee learns by making a number of mistakes but dares they admit them. Your boss can recognize your way of life and honesty when you mess up and admit your mistakes. When an employee takes responsibility for what he has done, the boss is happy though he is let down by his employee. In order to impress your boss and become his favourite employee, you can also make a plan to correct the issue and minimize the damage. If you desire to be your boss favourite employee then you need to discuss everything with your boss. Any matter that whirls regarding your work whether good or bad must be informed to your boss first. He must be updated with every aspect about you so that when questions regarding you are raised, he must be able to answer. You can represent yourself as a good representative for your boss and yourself by keeping your promises. People who take words seriously are many in an organization and hence keeping your words and working as per is important. It is a mark of reliability when you’re able to deliver what is asked. You will be committed with greater responsibilities when you act the way you say. In order to impress your boss and become his favourite employee make sure your loyal and discipline. A loyal employee is one who follows the rules and regulations in the organization and grasps the boss’s interest. By this way, there are more chances for the employee to become his boss’s favourite employee. When the morale in the office is low and every employee is dragging their feet for everyday work, when work productivity diminishes and more and more complaints gather up each day, then life for the organization is required. As an employee you should be a team player, who turns up for work in the right time every day, you must be one who does not complain, you should be an optimistic employee and motivate other employees at work. Your boss would like such kind of employee. Whenever there are any hassles or issues that happen in an organization, it is important to discuss with the line manager rather than with the big boss. When you get to your big boss directly then your line manager will also be put into trouble and hence discussion with the manager is important. When you’re managing a group of people make sure that you will be assessed first for anything that happens to the team. Being a leader and representative you have more authority than others in your team. When you request for aspects for the well-being of your team, your boss is impressed and your teammates too look up at you. It is clear that the only solution for a terrible situation is to laugh. When you laugh at boss’s jokes it’s highly encouraging. When you have a sense of humour then it is one biggest quality any employee should have. The more you feel and like to get appreciated make sure that your boss also needs it. Your boss may not remember who thanked him the last time, so when your boss is to quit and you want to show him your affection, then appreciate him and thank him for everything. Usually, leaders do not hear the positive impact about them until they are quitting out of work. Higher officials in your job may point out your aspects about how you might enhance your performance. In that manner, the employee must be open to constructive criticism. When you are able to take up criticism and present yourself as a positive role model for other employees, you’re making your managers job easier. These are a few aspects which help you to become your boss’s favourite employee. Not everyone can click with the managers. The following indicators are ones that make you likely to your boss. For employees who are still unaware about how to react and move forward in becoming the boss’s favourite employee can follow the above guidelines. In order to excel in a career, gain a hike, promotion or get desired opportunities in an organization becoming boss’s favourite employee is important. Only after following the right ethics and hard work can an employee become the boss’s favourite employee.